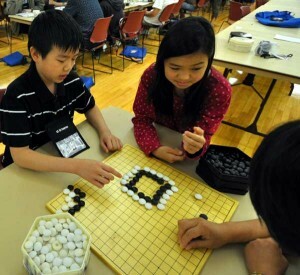 U.S. GO NEWS: Feng Yun/Jie Li Win North American Pair Go 1st Round; USYGC Season Opens; Kirby Sweeps N. California Tourney; SmartGo In S. Korea And Coming Soon To Ipad. FENG YUN/JIE LI WIN N.A. PAIR GO 1ST ROUND: Feng Yun and Jie Li defeated Wan Chen and Curtis Tang Sunday night in the first round of the North American World Pair Go Qualifier, played on IGS. “One pair withdrew at the last moment, and one member of another pair did not show up, so two games were not played,” reports Allan Abramson. Feng Yun and Jie Li will have a bye for the second round, and play the final game on Thursday night. Jing Yang and Jin Yu will play White vs Yuan Zhou and Yinli Wang on Tuesday night – also on IGS, in Round Two. KIRBY SWEEPS NORCAL TOURNEY: Brian Kirby topped February’s monthly ratings tournament in Northern California, February 6 in Menlo Park, CA. There were 25 players, ranging from 25 kyu to 7 dan, and two played in their first tournament ever. The next monthly ratings tournament will be March 6 in Palo Alto, CA. Winners report: Four game winner: Brian Kirby 2k 4-0. Three game winners: Lucas Baker 2d 3-1, Samuel Gross 1d 3-0, Roger Schrag 7k 3-0, Larry Qu 15k 3-1.
CORRECTIONS: Tetsuki allows players to connect to IGS, not KGS (Iphone/Ipod Apps, 12/7 EJ); apparently there’s no way, yet, to connect to KGS via the iPhone. However, for Android cellphone users, “there may be hope to connect to KGS, as per a thread on GoDiscussions.com,” reports Brian Kirby. Kiseido has just published the first three books of a seven-volume series, reports publisher Richard Bozulich. Graded Go Problems for Dan Players “is a translation of a 14-volume series put out by the Nihon Ki-in, compressed into seven volumes,” Bozulich tells the E-Journal. Targeted at aspiring dan players, the series is designed to provide low-kyu and low-dan players with the essential grounding in the basics of life-and-death, tesuji, and joseki needed to develop deeper and more accurate reading and the knowledge they need to compete as dan players. In “300 Life-and-Death Problems,” “300 Tesuji Problems,” and “300 Joseki Problems,” the level of the problems starts at around 5-kyu and works up to 3-dan, with the majority in the 1- to 3-dan bracket. The series will continue with volumes four to six, containing life-and-death, tesuji, and joseki problems for 3-dan players and stronger. Volumes seven will cover the opening (fuseki) and the middle game. Expected publication date for Volumes Four to Six is Spring 2010 and Summer 2010 for Volume Seven. GoGoD’s database of professional tournaments now exceeds 60,000 games, reports T Mark Hall. “This is the most accurate, consistent and exact database in existence in the West, backed by John Fairbairn’s Names Dictionary and his Tournament Database,” Hall tells the E-Journal. 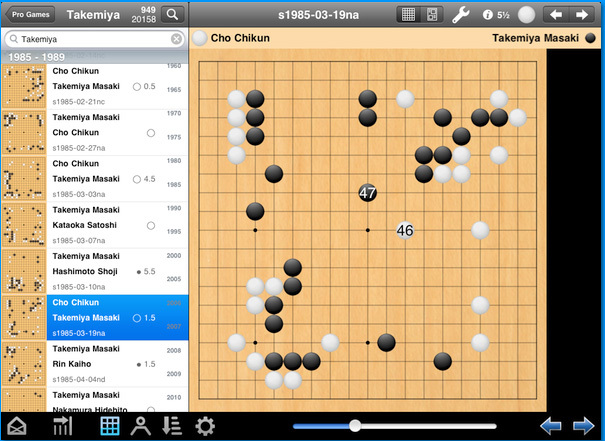 “While we always add all the games from the current tournament scene, we have been busy in the last six months adding games from the 1950s and 1980s, including previously unknown games by Go Seigen and other games by famous players, not in their collected games,” says Hall. “We pride ourselves on providing games no-one else can easily get, but of course, as always, we are bang up to date.” The Winter 2009 edition is due out on December 7 and the celebrate the 60,000-game milestone, GoGoD is being offered at a discounted rate of $30 for a single copy and $40 for a copy plus an update in a year’s time. 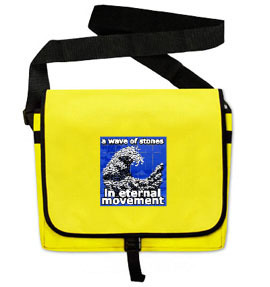 Contact Hall at tmark@gogod.demon.co.uk to order or for details. Go teacher Joey Hung 7d is shuttering his Fremont, CA-area school “for a while” he tells the E-Journal, to focus on business opportunities. Meanwhile, Gabriel Benmergui 6d and Ali Jabarin 6d have just started up the online Atsumi Go School, which offers lessons, study groups and free game commentaries of games played between students. Benmergui is a top Argentinian player who has studied in Lee SangHun’s school, at Kim Sung-Rae 4p’s KBC school in Korea and represented Argentina at the World Amateur Go (WAGC) Championships and the World College Go Championship, where he defeated both Korean amateurs. Jabarin, Israeli champion for the last three years, placed 13th in the WAGC and represented Israel in the 2008 World Mind Sports Games, and is the current European Youth Champion. 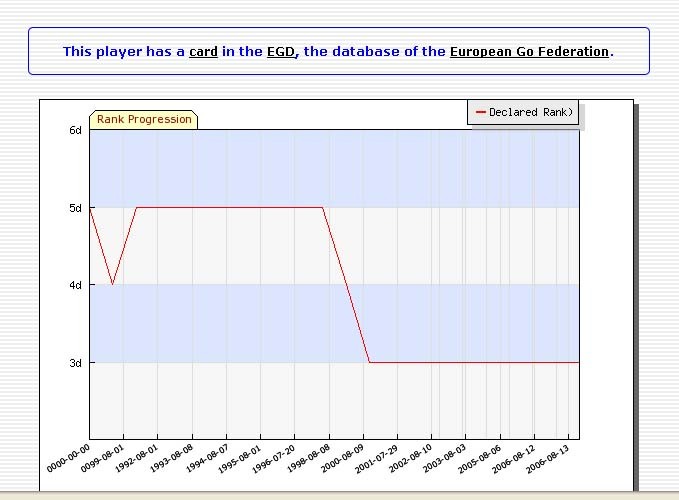 The new AGA Player Database and the European Go Database have now been cross-referenced with links for those players who have competed in events in both Europe and the United States. The new links are shown in the cards of players who are in both databases: a box appears with a link to the same player’s card in the “foreign” database. Currently, more than 300 players appear in both databases; examples include Ian Davis, Horst Sudhoff and Thomas Derz.